Although known as meteorite since at least 2003 Santa Vitoria do Palmar did not find its way to a laboratory before 2005. The fact that SVP today is classified and published is due to the tireless efforts of Senór Correia who contacted the author in November 2005 and submitted a sample. The polished endcut that was first sent to Germany weighed 110 g and was taken from the 10.450 kg mass . The exterior exhibited a dark brown and moderately weathered rind. The cut section displayed a remarkably unequilibrated texture with a broad variety of chondrules. Almost all of the known crystallisation patterns were present. Everything pointed to a quite extraordinary type 3 chondrite. The cut section also displayed large portions which were darkened due to shock metamorphism. Some islands of lighter colored portions embedded in the shock-blackenned matrix showed no change of colors at all. The center section of the specimen pictured above shows such a portion. On behalf of the author, a 20 gm sample and a a number of macro images were sent to the Humboldt University in Berlin, Germany, in early December 2005. The mineralogical and petrographic analysis was conducted by Dr. Ansgar Greshake, curator of the world famous meteorite collection of the Berlin Museum of Natural History. After thinsections were made and studied it became evident that the Santa Vitoria do Palmar meteorite has to be placed in the group of L3 chondrites. Dr. Greshake’s decision was also the first scientific confirmation, that the material found in Brazil was in fact meteoritic. The writing of the submission text to the Nomenclature Committee of the Meteoritical Society raised a question of particular interest to all parties involved: Is there enough evidence to link the findings of 2003 and 2004 with the fireball sighting of 1997? In other words, is SVP to be considered a fall or a find? The weathering grade usually is an appropriate indicator to shed some light on the question of terrestrial residence time. Unfortunately all of the SVP finds were made in an area with an exceptionally aggressive microclimate. The sandy soil of the Mirim Lagoon shores is humid and contains a high level of diluted salts. The huge difference between summer and winter temperatures as well as between day and night time temperatures increases the effects of chemical and mechanical weathering on an alien mineral embedded in this harsh environment. 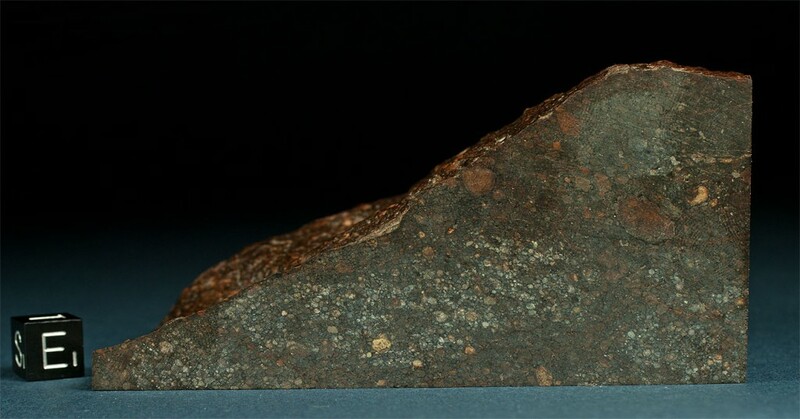 According to the experts it is most likely that a meteorite exposed to this environment for a period of only six years will display the apparent weathering phenomena found within the SVP material. Since at least eight years must have passed after the potential fall, a detection of short-living cosmogenic radionuclides could no longer be expected. Thus, a final determination on this issue is no longer possible. The Nomenclature Committee of the Meteoritical Society, however, decided that according to its rules, the meteorite could only be accepted as a find but not a fall. This is by no means unusual as the case of the Russian meteorite Tsarev demonstrates. Although Russian newspapers reported as early as 1921 on the Tsarev fall, and although the fall site had been known to the locals for decades, in 1978 Tsarev was officially recognised – as a find in fact, and not as a fall. As is the case with SVdP, too much time had passed between the sighting of the fireball and the first discoveries. Santa Vitoria do Palmar was published in Meteoritical Bulletin 91 (2007), the write up can be accessed here.